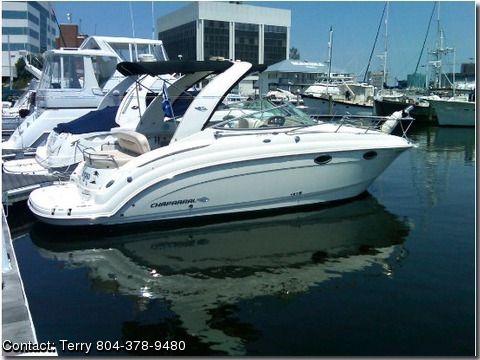 Please contact the owner directly @ 804-378-9480 or terryhoal(at)gmail(dot)com.This 2007 Chaparral 270 Signature Cruiser (LOA 29) is powered by an 8.1, 375hp Volvo Penta engine with dual props. This is a Great boat for lakes and rivers or the Bay!!! Trailer is included for towing.This boat is loaded with options to include but not limited to:Remote control spotlight, Windlass Anchor system, radar arch w/hinge,Air Conditioning/Heat, flat screen color TV/DVD w arch antenna and cable ready,AM/FM/CD, Ray Marine VHF radio, Garmin GPS chart plotter with data card, vacuflush head and more…Full spec's available upon request.All Scheduled maintenance up to date.Approx. 135 hours.